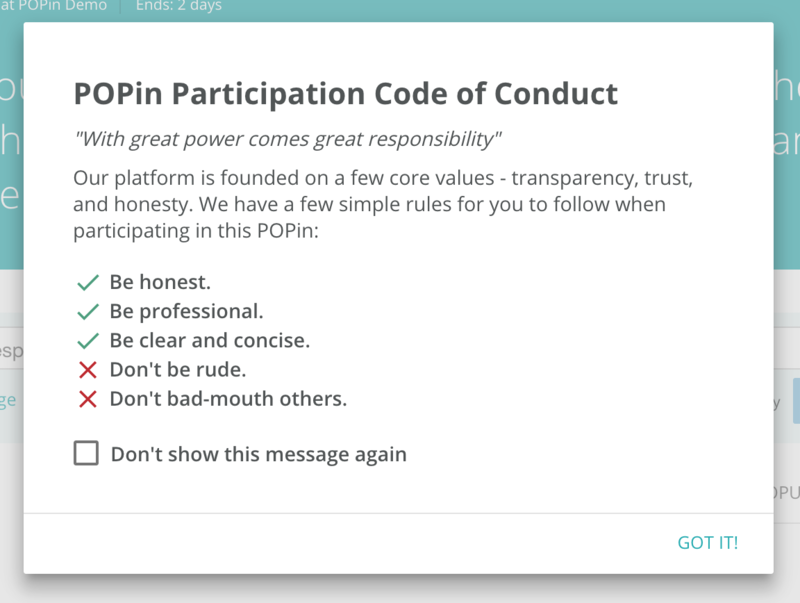 What is the POPin user code of conduct? Learn our top tips on how to participate productively in a POPin. POPin's mission to help leaders solve problems with buy-in from the crowd. We believe the people closest to the problem have the best ideas for solutions. Be honest. Be candid and direct, so others know exactly what to vote on. Be professional. Keep in mind: the people you work with are reading what you write! To maintain a cordial atmosphere, bring that same tone you’d use in a team meeting to the POPin. Be clear and concise. The more words you use, the less likely your leader will know exactly what action you want them to take. With POPin, less is often more! Be rude. Avoid explicit, obscene or hateful content. Candid conversation sparks positive change, but only with a respectful foundation. Bad-mouth others. Kindergarten rules apply: avoid pointing fingers, or you may just start a food fight in the cafeteria. Offer problems without solutions. For every problem you uncover, try to think of a creative solution to address it.